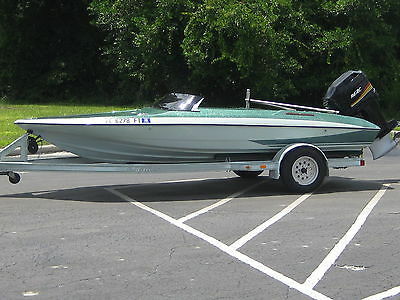 This is a 1988 Glastron Carlson CVX 18. The boat was fully restored with new motor, out drive, composite stringers, and much more. The boat is wood free from the floor down. The pant is all craft 200 with gel coat on the bottom. The motor is a merc 383 and the outdrive is a bravo 1 built by all American drive to hold up to 650HP. Upholstery was redone and the blue and gray is carbon fiber look. It is sitting on a new McClain trailer with welded bunks. Their is not been a nut or bolt on this whole boat that has not been touched. Payment can also be made in person after a deposit with PayPal. 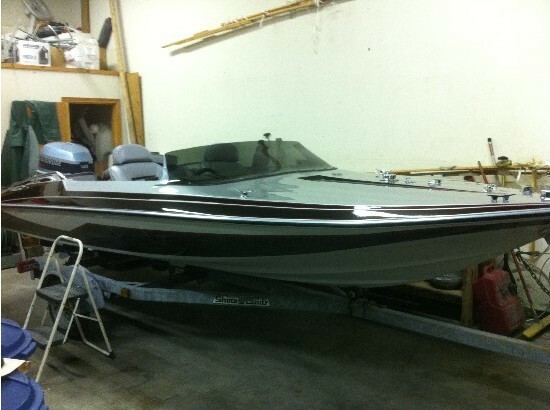 Up for sale is a 1986 Glastron Carlson CVX-18 that has been very well cared for. It has a 5.7 liter Chevy 350 for the power plant producing 270 HP with a MerCruser AlphaOne outdrive and a stainless steel prop. As you can imagine, this is a very fun boat; it is short (18 feet) and light with a lot of power. 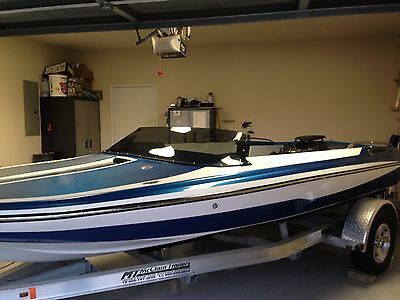 I've had it up to 64mph on the GPS.This is a great speed boat looking for a new home. As with all boats this age, it needs a fair amount of work every summer to keep it running. As I am only on the lake for a short time each summer, I need something a little more turnkey. The boat is sold as-is and all sales are final. 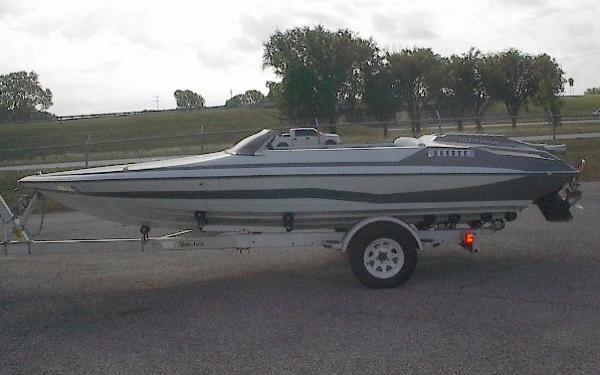 Please conduct all inspectiona and ask all questions prior to bidding.I've owned the boat for six years and have meticulously cared for the boat -- The boat has always been covered, always properly winterized, always stored inside and all standard maintenance has been performed on a regular basis. (oil, filters, plugs, belts, ect)Additionally, the following has been done while in my care:• Complete trailer rebuild • Custom matching full Sunbrella mooring cover• Carburetor rebuilt• All floatation and wood replaced in the stern• Added space for a second battery• Installed marine speakers • New thermostat• New speedometer and spedo pickup• Replaced all bellows• New 700 GPH bilge pump• All through-hull fittings have been resealed• West-System fiberglass and epoxy touch-ups on the hull • Many more things that I cannot recall right nowThe boat had the interior redone (look at the photos, it is in mint condition!) and the gas tank replaced prior to my purchase. Mechanically, the boat is in top shape. The gelcoat has some scratches that go with the age of the boat and could use a good buffing. But, the metal flake paint still shines in the sun! I imagine that the hull could use a little more fiberglass touchup. Structurally, the boat feels solid but I have a feeling that some work will need to be done in the next few years.It makes me sad to part with this boat -- I hope to find a great home where it will be well cared for. Please contact me with any questions. 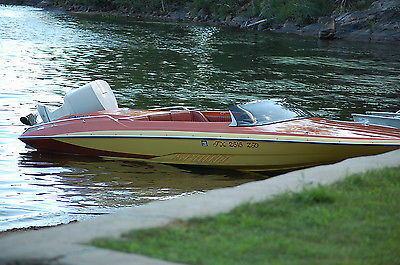 Rare 1979 Glastron & Carlson CVX-16ss Bought this boat to keep it from being crushed. 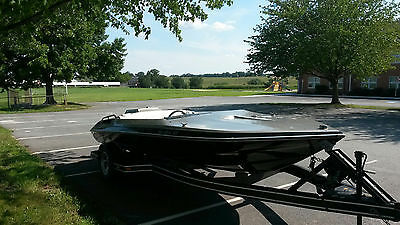 Past owner originally got the boat for the engine as a donor, Ended up not being the correct 4cyl for his application. So it sat for a few years where he stored it. He needed to get it out of storing location and that is how I ended up with it. Mechanics: Engine (4cyl mercruiser 120hp). Was locked up when I got it (rusted Piston rings to the cylinder walls) I pulled the engine and tore it down completely. I was pleasantly surprised to see that the crank/cam and all bearing had hardly any wear on them. Leads me to believe it was a fresh rebuild not long before it sat. despite the rings being rusted, The cylinder wall Honed out nicely. ( note: They are Bored .030 over by past rebuild) I cleaned up pistons, checked clearances and installed new piston rings. I also checked all other clearances for good measure while I had the engine apart. Then re-installed all components with new gasket kit, New thermostat also installed. Carb. was rebuilt. Exhaust manifold appeared to fairly new. ( clear of junk, in water jacket) Engine was then re-installed in the boat. Properly aligned for the out drive. Runs fine now, Will probably need valves adjusted again after some more run time. And run to with good clean gas throw it. ( Still had some old gas in tank) I was able to get the boat out for a test run on the water once. NO leaks, Bilge does work and was not needed once out on the water. Boat got up on plane with ease. Ran fine however temp did rise at higher RPM and came down at lower RPM. ( bad impeller in the out drive) The impeller has sense been replaced with a new kit. Out drive was installed with new gaskets. Boat shifts into all three positions ( forward, neutral, reverse). Could use some fine adjustments. Gauges all work with the exception on the tech and fuel gauge. Hydralic pump and trim work perfectly. (new style pump) I will not claim this engine to be a fresh rebuild, but you will not get much better then this one without actually paying for the work to be done. Based of the condition the internals ware in. Cosmetic/structure: Fiberglass hull has a few minor nicks in it, typical for this old of a boat. Again does not leak. Everything appears to have been re painted at time of previous over hall. The paint is currently cracking in some areas, but still in presentable shape. The one time I had it out it got a lot of head turns and ppl asking about it. Interior has two brand new front seats and rear bench seat is still in great shape, over all the interior is again presentable. Floor has no soft spots. Dash light work as well as the front lights. Rear mooring light is missing ( New can be bought for pretty cheap) Brand new rear plug for the bilge hole. Trailer: Original trailer to this boat. It is in need of some TLC, but it does hold and tow the boat fine. I towed it an hour and a half with no issues. The brake lights and turn signals work, running lights do not seem to work. (I have not got around to looking at that yet) I would plan on new winch cable and just plan on going over the trailer before making long trips with it. I do not have title for either boat or trailer. Some older boats never did have titles issued to them. I am unaware whether or not that is the case for this boat or not. I bill of sale will be given with the sale. I did look into title a little, and does not seem to be an issue to get one. Due to the boat not being registered I do not want to take it out and risk the fine. If I get a title issued before it sells I have not problem giving test rides to serious inquires only. Otherwise I can run it on muffs in the driveway. I have no obligations to sell by the end of this season. I may do more work on it over the winter to make it more appealing to a potential buyer. Boat is for sale locally also. Please call me or text me at 717-419-2553 to come look at it. Or email at cmshrom07@yahoo.com. For any additional pictures wanted email me, And I'll gladly take some for you. This is the last time I'm listing this on here till spring, Assuming it doesn't sell between now and then. 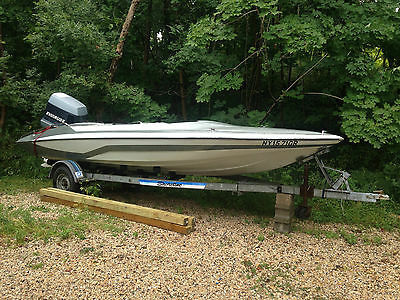 Up for sale is a 1986 Glastron Carlson CVX-18 that has been very well cared for. It has a 5.7 liter Chevy 350 for the power plant producing 270 HP with a MerCruser AlphaOne outdrive and a stainless steel prop. As you can imagine, this is a very fun boat; it is short (18 feet) and light with a lot of power. 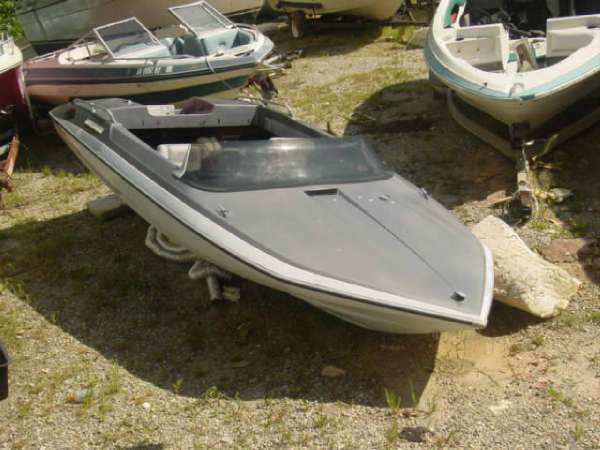 I've had it up to 64mph on the GPS.This is a great speed boat looking for a new home. As with all boats this age, it needs a fair amount of work every summer to keep it running. As I am only on the lake for a short time each summer, I need something a little more turn-key. The boat is sold as-is. I've owned the boat for six years and have meticulously cared for the boat -- The boat has always been covered, always properly winterized, always stored inside and all standard maintenance has been performed on a regular basis. (oil, filters, plugs, belts, ect)Additionally, the following has been done while in my care:- Complete trailer rebuild - Custom matching full Sunbrella mooring cover- Carburetor rebuilt- All floatation and wood replaced in the stern- Added space for a second battery- Installed marine speakers - New thermostat- New spedo pickup- Replaced all bellows- New 700 GPH bilge pump- All through-hull fittings have been resealed- West-System fiberglass and epoxy touch-ups on the hull - Many more things that I cannot recall right nowThe boat had the interior redone (look at the photos, it is in mint condition!) and the gas tank replaced prior to my purchase. Mechanically, the boat is in top shape. The gelcoat has some scratches that go with the age of the boat and could use a good buffing. But, the metal flake paint still shines in the sun! The hull could use a little more fiberglass touchup to keep things in good shape. Structurally, the boat feels solid but I have a feeling that some work will need to be done in the next few years.It makes me sad to part with this boat -- I hope to find a great home where it will be well cared for. Please contact me with any questions prior to making an offer. 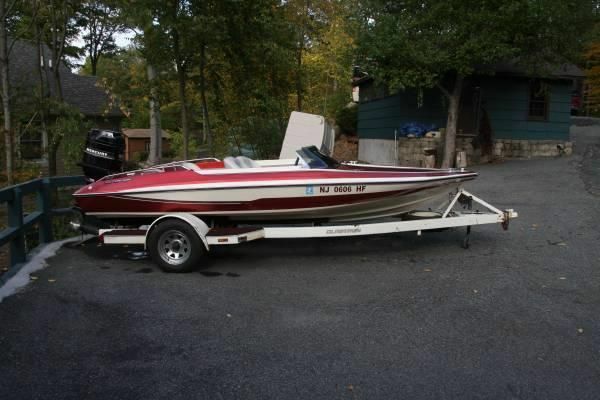 Selling my 79 Glastron. Boat is too big for the lake that I typically vacation on. Looking for something smaller. 1980 200HP Johnson runs great. Maintained by marina each season. Used only in freshwater. Could use some paint on the lower unit. Interior has driver seat and rear bench. A couple minor tears. New gauges, radio. I use this boat often so it has some scratches and dings, but overall the paint is still great. Topsides still sparkle. 2012 aluminum LoadRite trailer with low miles. Custom cover. factory alum. trailer, alum. rims, new tires,wiring,lights. interior new floor w/marine carpet, marine grade vinyl seats. full gauge panel, steering wheel w/push button trim, new ride guide duel steering cables. transom loading switch. AM/FM/Stereo, waterproof speakers. new fuel system, deck tank to motor, hoses, water separator, fuel filter, etc. auto bilge pump. Engine mid 80's high perf. V6 making 200+HP custom low water pickup w/nose cone. 26pitch SS protestor prop. high ratio gear lower unit. recent tun up, complete rebuild of three carbs and soft lines. 1 pc. race cover, paint w/clear coat, custom made Merc. decals. flush mount SS deck hardware including all bolts and screws. (rear seat included, just not in pic). original gel-coat, not repainted, like new condition. this is an honest 60++MPH rig!! new composite transom w/alum. jack plate. FRESH WATER only!! 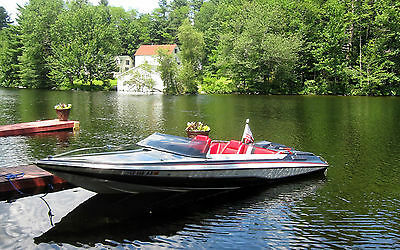 QUESTIONS?, Call Chuck..
1984 glastron envinrude with 300 hp v8 outboard, NEW ENGINE TIME CAPSULE!